Ships in just 1-2 days! 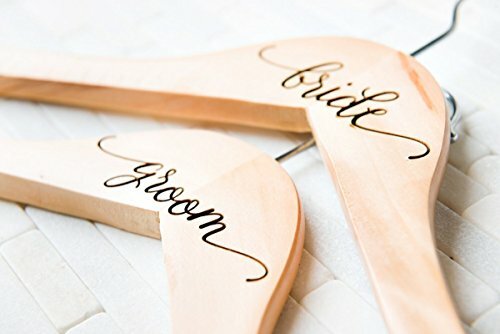 Bride and Bridesmaid Dress Hangers, Personalized Left Coast Weddings is proud to produce the highest quality dress hangers available! Available in Blonde or Cherry wood, your hangers will be made up with care and shipped very quickly from our little workshop in Largo, Florida. Letters are deeply engraved into the wood for a luxe look and feel. ——–Ordering———– Just specify what names (one name per hanger) you’d like in the ‘Notes to Seller’ section when checking out. You can add up to two smaller lines beneath the name shown, such as ‘bridesmaid’ and the date. We think one line of text looks best! You can do two or three lines, just as the pictures show. Please note that Designs 2 and 3 have two separate fonts, one for the top line and the remaining line(s) are a different font. These are also available with the cross bar attached for hanging suit pants. If you’d like the pants cross bar on your hanger just let us know in the ‘Notes to Seller’ section when checking out. ——————————– Measures approx 17.5in across. We ship in 1-2 days from Largo, Florida. So most customers get their delivery within a week! Thanks for shopping Left Coast Weddings!